So, what causes that sound? You snore because your breathing is obstructed in some way, usually because relaxed tissue is blocking your airway. As you breathe in, the air flowing past these tissues causes them to vibrate. And that vibration is what causes the sound you make when you snore. But what isn’t so simple is figuring out exactly what’s causing that obstruction in your particular case. Because what’s causing the obstruction can differ from one snorer to another. You might know other people who snore, like members of your family. But the underlying cause of your snoring might be completely different from theirs. A remedy that works for them might not work for you. So, if you want to stop snoring, your first step is to figure out what, specifically, is causing you to snore. Then you can take steps to deal with that specific, underlying cause. Here are a few of the things that can cause snoring. These aren’t the only things that can do it, of course. But they are the most common snoring causes. 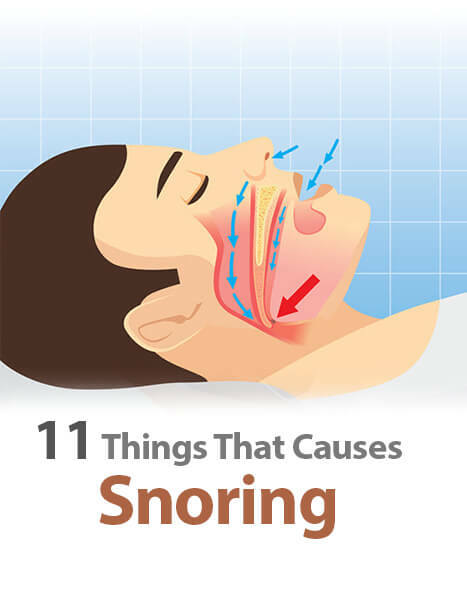 Chances are good that something on this list is the primary cause of your snoring. There’s a reason some people only snore after consuming alcohol. Our bodies have natural defenses that are meant to prevent our airway from being blocked or obstructed while we sleep. But when you drink alcohol, those defenses are decreased to some degree, just like your reflexes and mental alertness. Alcohol depresses the central nervous system, which causes the muscles in the body to relax. This includes the throat muscles. And relaxed throat muscles, which can obstruct your airway, are a common cause of snoring. Alcohol can also cause relaxation of the tongue so that it can also fall back and partially block the airway. And that’s not all. Alcohol can also cause nasal congestion, another common cause of snoring. If you think alcohol is causing or contributing to your snoring, make sure you stop consuming alcoholic beverage at least four hours before you intend to go to sleep. This may be long enough for the effects of the alcohol to wear off so that you won’t snore when you go to sleep. But there are no guarantees. And what about sleeping pills? Many snorers turn to sleeping pills hoping they’ll help them sleep through the night. That, even if they snore, the sleeping pills will keep them from waking up. But many are woken by their own snoring even on nights when they take sleeping pills. 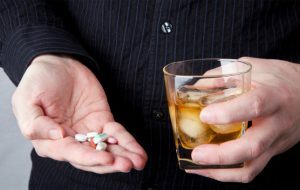 They never realize that, because sleeping pills relax their throat muscles much like alcohol does. There are some nights when taking those sleeping pills is actually what’s causing them to snore. Sedatives and tranquilizers are another culprit. These medications are designed to help you relax. Unfortunately, they can cause your throat muscles to relax too. If you’re doctor has prescribes sedatives or tranquilizers, make sure you tell him or her that you are a snorer. They might come up with an alternative that won’t make your snoring worse. An allergic reaction can cause you to snore. 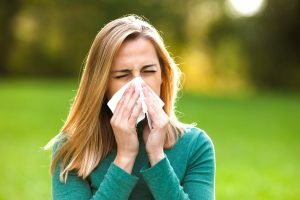 Fortunately, you can take steps to deal with some of the things that might cause you to have allergic reactions. Many allergy sufferers are affected by common allergens like mold, dust mites and animal dander. So you should try to keep your bedroom free of both by dusting and vacuuming often. If you have a pet, like a dog or cat, consider keeping said pet out of your bedroom. Or at least off of your bed. Your pillow can also cause you to snore. It doesn’t take long for a pillow to collect enough dust and dander to trigger an allergic reaction. So, on those nights when your snoring is really intense, the pillow you’re resting your head on while you sleep could be the reason. Every two weeks or so, toss your pillow in the dryer, set your dryer to “fluff,” and let it run through the entire cycle. This should get rid of most of the dust and dander that might have made its way into your pillow. You should also replace your pillow every few months. In fact, if your pillow is over 6 months old, you definitely need a new one. Allergies can also cause congestion, another common cause of snoring. You can deal with your congestion at night by using nasal dilators, an affordable and effective way to keep your nasal passages open as you sleep. However, you should take care when using both oral decongestants and decongestant sprays. If you use an over the counter decongestant more than three nights in a row, it could end up making your congestion (and, as a result, your snoring) even worse. A possible alternative to over the counter decongestants are herbal nasal sprays. Herbal sprays can treat congestion just as effectively. But because they’re made with natural ingredients, they are safer for long term use. This is good news for allergy sufferers, who might have to deal with congestion on a regular, if not nightly, basis. Did you know that snoring itself can cause you to snore? Or, rather, the damage caused by frequent or severe snoring can either make you snore more often, or make your snoring more intense. The stress caused by frequent snoring can weaken the muscles in the upper airway, which affects the tongue and soft palate. This makes these muscles more prone to collapsing enough to obstruct your airway, and cause you to snore. If your snoring originates in the tongue or soft palate, an anti-snoring mouth piece could be the solution you’re looking for. There are many different kinds of mouthpieces that can prevent snoring. Two of the most common and popular are MAD (or Mandibular Advancement Device) mouthpieces, and TSD (or Tongue Stabilizing Device) mouthpieces. MAD mouthpieces work by moving (or advancing) your lower jaw forward. This holds the airway open, which can prevent or alleviate snoring. A MAD mouthpiece will also stabilize the tongue, holding it forward so that it can’t fall back into the throat and obstruct your airway. The soft palate is advanced as well, so all of the bases are covered. Many snorers stay away from MAD mouthpieces because of the unfavorable things they’ve heard about them in the past. These devices have come a long way in the last 10 years. In fact, the MAD mouthpieces you can get today are quite a bit better than those available even 5 years ago. And the makers of MAD mouthpieces are constantly working to make them more comfortable and effective. The MAD mouthpiece is an extremely effective snoring remedy, but doctors and dentists usually don’t recommend Mandibular Advancement Devices for snorers who have dental problems. TSD mouthpieces work by stabilizing the tongue, holding it forward so that it can’t fall back and block the airway. This also helps to make more space at the back of the throat, which will also help prevent snoring. A Tongue Stabilizing Device might not work for as many snorers as a MAD mouthpiece would. If you suffer from dental problems and can’t use a MAD mouthpiece, a TSD mouthpiece might be a great alternative for you. One difference between a MAD mouthpiece and a TSD mouthpiece is that, for the most part, a TSD is one-size-fits-all. You can start wearing it “right out of the box.” A MAD mouthpiece, on the other hand, works best when it is specially fitted to each individual’s mouth. The good news is that, with many MAD mouthpieces, the buyer can do this fitting themselves, at home, in just 5 or 10 minutes. Another scientifically proven solution is to strengthen your throat muscles so that they don’t collapse at night during sleep. This can be achieved with simple 3 minute exercises that opera singers use to strengthen their throat muscles for singing. It works wonders for snorers as well. Excessive weight is one of the most common causes of snoring. 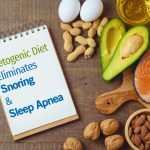 In fact, one of the first things many doctors do when they find out a patient snores is recommend they lose a few pounds, and try to get as close as possible to their ideal weight. If you only started to snore after you put on a few extra pounds, losing that extra weight might the solution to your snoring woes. When you gain weight in the rest of your body, you gain it around your neck too. Thicker neck tissue will decrease the throat’s internal diameter. As a result, it becomes more likely that your throat muscles will collapse while you sleep, partially obstruct your airway, and cause you to snore. As you lose weight, the excess tissue in your throat will begin to disappear. And the more weight you lose the less frequent and severe your snoring will be. If you think excess weight is causing or worsening your snoring, returning to your ideal weight should be your first priority. This means getting more exercise, cutting your daily calorie intake, and eating healthier snacks. Not only will this help to alleviate your snoring, it will also improve your overall quality of life. Of course, excess weight isn’t the only thing that can cause snoring. There are plenty of thin people out there who snore too. 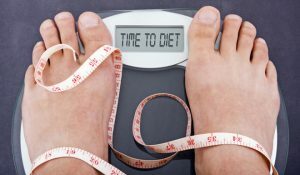 But excess weight can definitely be a contributing factor. Even if something else is the primary cause of your snoring, losing weight and being more active couldn’t hurt. If your snoring originates in your nose instead of in your throat or soft palate, you want to do everything you can to keep your nasal passages open and clear when you sleep. That means dealing with anything that might be narrowing or blocking your nasal passages, like nasal congestion. Nasal congestion narrows the nasal passages, making it harder for air to travel in and out of your airway. How can you tell whether or not your snoring originates in your nose? Well, if you only snore during allergy season, or when your nose is stuffy from a cold, that’s a pretty clear indication. There are many remedies for nasal congestion. One is over the counter decongestant. Oral decongestants and decongestant nasal sprays can certainly work to alleviate nasal congestion. But if you use them too often they can have a rebound effect, and make your nasal congestion even worse than it was before. Nasal dilators are another alternative. This over the counter remedy is cone shaped and made from soft, medical grade silicone. When inserted into your nostrils they lift and open your nasal passages so that you breathe more freely through your nose. They work well for those suffering from allergies, congestion due to cold. And if you have a deviated septum, nasal dilators might work for you too. If you don’t have access to any over the counter remedies, you can always try taking a hot shower before you got to bed. The warm, moist air will open your nasal passages so that you breathe more easily, at least for a while. But the effect might not last you through the night. And it might not be the ideal alternative if you prefer taking your showers in the mornings. Nasal irrigation is another effective remedy for nasal congestion. And one of the most popular nasal irrigation tools is the Neti pot. In fact, many doctors recommend Neti pots to patients suffering from allergies and sinus problems. Made of plastic or ceramic, a Neti pot works by thinning the mucus in your nasal passages. A safe and simple salt water solution flushes the mucus away, leaving your nasal passages clear so that you can breathe freely again. Whatever remedy you use for your congestion, don’t forget to drink plenty of water. If you’re dehydrated, the secretions in your nasal passages will be thicker and stickier. This might not be the primary cause of your snoring, but it could make your snoring worse. So drinking more water every day, especially if you suspect you aren’t getting enough, could be an easy way to alleviate your snoring. It’s common for those suffering from Obstructive Sleep Apnea (or OSA) to also snore. OSA is a serious medical condition. As OSA sufferers sleep, their throat tissues block their airway either partially or completely. As a result, they can actually stop breathing. Eventually, the body reacts to the lack of air, and the sufferer will wake up, usually with a snort or gasp. Sooner or later, the OSA suffer will manage to go back to sleep. Only to be woken up a few hours (or even minutes) later when their breathing stops again. This cycle is repeated throughout the night, sometimes dozens of time. And snoring is often part of that cycle. OSA sufferers will often snore for a period of time, and then their snoring will stop abruptly when they stop breathing. The most common treatment for OSA is CPAP, which stands for “Continuous Positive Airway Pressure.” The OSA sufferer wears a pressurized mask over their mouth that’s attached to a pump. While they sleep, the pump pushes air into the airway, forcing it to stay open. 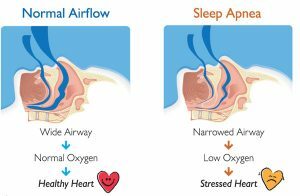 Not only does CPAP ensure that the OSA sufferer won’t stop breathing during the night, it also keeps them from snoring. 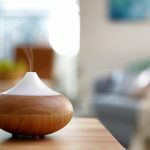 As effective as CPAP is as a snoring remedy, many people find the mask they have to wear, and the sensation of air being forced into their airway, uncomfortable. Many also find the CPAP machine too loud, and find it hard to sleep due to the noise made by the pump. That’s why, as effective as CPAP can be at stopping snoring, it is usually reserved for those suffering from OSA. As strange as it might sound, it’s possible to be too tired when you go to bed. The harder you sleep, the more relaxed your throat muscles will become. The more those muscles relax, the more likely it is that your airway will become partially obstructed. And if your airway is partially obstructed, you will probably end up snoring. So snoring keeps you from getting enough sleep. As a result, you barely have enough energy to get through the day. By the time you go to bed you’re exhausted and fall into a deep, hard sleep. This causes your throat muscles to relax too much and partially obstruct your airway. Which causes you to snore. Which keeps you from getting enough rest. So you drag through the day, and go to bed exhausted. Yep, it’s a vicious cycle. One way to break the cycle is to make sure you go to bed early enough to get enough sleep. If you typically go to bed just 5 or 6 hours before you need to get up the next day, try to pick an earlier bedtime. Adults should get at least 7 to 8 of sleep per night. 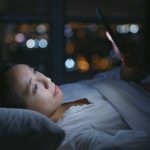 So you should go to bed at least 8 to 9 hours before you need to get up in the morning. But what if you go to bed early enough, but snoring keeps you from getting enough rest? The solution for that might be taking a nap in the afternoon. The longer the nap is the better. 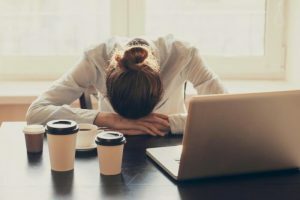 But even napping for 10 to 30 minutes could keep you from being “too tired” when you go to bed. And don’t worry that taking a nap during the day will make it harder for you to get to sleep at night. As long as you wake from your nap at least 3 hours before your bedtime, you shouldn’t have any trouble getting back to sleep. The position you sleep in can cause you to snore, or make your snoring worse. Lying on your back can cause the base of your tongue, as well as your soft palate, to fall back into your throat, partially obstructing your airway and causing you to snore. And, when you sleep on your back, gravity can affect your throat in such a way that it actually narrows the airway, which can also cause snoring. If sleeping on your back is what’s causing you to snore, the solution is simple. All you have to do is stop sleeping on your back and start sleeping on your side instead. But if you’re used to sleeping on your back, training yourself to sleep on your side instead can be difficult. Even if you’re lying on your side when you fall asleep, there’s a good chance you’ll roll over onto your back at some point during the night. After all, it’s hard to stop yourself from doing something when you’re unconscious. A full body pillow is one possible solution to this position. You can position these pillows in such a way that they will make it difficult for you to turn over onto your back while you sleep. At least in theory. Sometimes these pillows can shift just enough during the night that they won’t prevent you from rolling onto your back. In fact, you might wake to find yourself sleeping on your back on top of the pillow. Another solution you might have heard of is to tape a tennis ball to the back of your sleep clothes with duct tape or masking tape. This way, if you turn over onto your back, the discomfort of lying on top of a hard, round tennis ball will wake you up. Once awake, you can turn over onto your side again. But having a tennis ball sticking you in the back isn’t very comfortable. Besides, part of the reason you want to stop snoring is so that you won’t be woken up in the middle of the night. And being woken up by a tennis ball isn’t much better than being woken up by your snoring. Besides, what if you just prefer sleeping on your back, and don’t want to train yourself to sleep on your side. In that case, an anti snoring pillow might be just what you need. Anti snoring pillows, which are usually made of memory foam, hold your head in a position that keeps your airway open and unobstructed. This allows you to sleep on your back without snoring. But many find these pillows uncomfortable. And some don’t like the fact that they have to sleep with their head in a specific position in order for the anti snoring pillow to actually work. If you don’t want to use an anti snoring pillow, you can try an anti-snoring smart pillow. 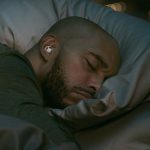 Anti-snore smart pillows are a high-tech version of the traditional anti snoring pillow. 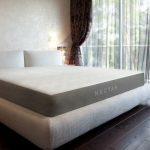 Anti snore smart pillows, which you either plug in or charge up, are able to detect when you have started to snore. Then the pillow takes some sort of action, like gently changing your head position, to open your airway and alleviate the snoring. The great thing about anti snoring smart pillows is that they will work no matter what position you sleep in. It doesn’t matter if you sleep on your back or your side. In fact, some of these pillows even claim to work for those who sleep on their stomachs. Sleeping with an open mouth is one of the biggest reasons why people snore. Even if sleeping with your mouth open isn’t the primary cause of your snoring, it could definitely make your snoring worse. When you inhale through your mouth as you sleep, the air you breathe in can hit the back of your throat with enough force to cause the soft tissues to vibrate, creating that unpleasant, buzzing sound you make when you snore. Sleeping with your mouth open can also be a symptom of another cause of snoring, nasal congestion. If your nasal passages are so narrow that you aren’t able to get enough air by breathing through your nose, or if both of your nostrils are blocked, you’re body will compensate by opening your mouth so that you can get more air that way. Also, if your throat is obstructed by soft tissues, and you aren’t getting enough air as a result, youre body may pull air in with greater force in an attempt to get more air. And that increased force can cause soft tissues to vibrate even more. The anatomy of your mouth can also cause you to snore. If you have a thick or low soft palate, it could be narrowing and obstructing your airway enough to contribute to your snoring. And you know that piece of tissue that dangles at the back of your throat? It’s called the uvula. And if yours is elongated, it could be obstructing your airway. It can be hard to tell what you do or don’t do while you’re asleep. But your partner, or someone else who has seen you sleep, may be able to provide an answer. If you are sleeping with your mouth open due to nasal stuffiness, allergies, small nostrils or a deviated septum then a nasal dilator can improve your nasal breathing. Chin straps are also very effective at keeping your mouth closed during sleep and promote nasal breathing. Ever hear of nasal resistance? If you’re a snorer, you could be suffering from it without knowing it, because snoring can be one of the side effects of nasal resistance. Anything that causes a narrowing of your nasal passage can cause nasal resistance. Two common causes are nasal congestion and nasal collapse. And if you just naturally have smaller nostrils, that could also cause nasal resistance. Another possible cause is anatomical abnormalities, like a deviated septum, where the partition between the nostrils is crooked. One way to prevent or alleviate nasal resistance is to use a nasal dilator. A nasal dilator widens the nostrils and stiffens the walls of the nasal passage, decreasing (or even eliminating) nasal resistance. Either your snoring will be less intense, or you won’t snore at all. A nasal dilator will sometimes work in cases where the usual remedies for nasal congestion, like nasal strips and decongestant sprays, don’t. You probably already know all of the good reasons why you should stop smoking. There are dozens of them. And here’s another one. Smoking could be causing you to snore, or making your snoring far worse than it would be if you didn’t smoke. One of the first things doctors tell their snoring patients is to try to lose weight. And, if the doctor finds out the patient smokes, telling them to stop smoking is often second on their list. 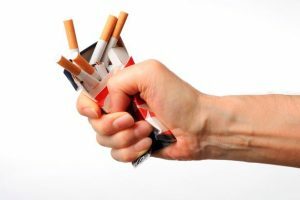 Cigarette smoke can irritate the lining of both your nose and your throat, causing them to become swollen and inflamed. This can result in both nasal congestion and a narrowed airway, both of which can cause or contribute to snoring. The more you smoke, the more irritated and inflamed the lining of your throat and nasal cavity will get. If you stop smoking, it will help to alleviate or even eliminate your snoring. Not to mention all of the other health benefits. And many who have stopped smoking found that they either stopped snoring entirely, or the frequency and intensity of their snoring decreased. Of course, “quit smoking” is easier said than done. So what can you do to help your snoring while you’re trying to quit? Well, you can try to stop smoking at least 3 or 4 hours before you go to bed. That might be long enough for the affect cigarette smoke has on your throat to wear off so that you won’t snore. But this is only a temporary solution, and nowhere near as effective as giving up cigarettes altogether. Also, the unfortunate truth is that you don’t have to be the one smoking in order for cigarette smoke to be irritating your throat and nasal cavity. Second hand smoke can do it to. But, of course, the effect won’t be nearly as severe as it is when you smoke yourself. Still, close to bed time, it might be a good idea to avoid situations in which you are likely to be surrounded by cigarette or cigar smoke.